It has been three months since Sabah Wildlife Department (SWD) sad discovery at Gunung Rara where 14 pygmy elephants were found dead – one of which was Joe’s mother. The elephant calf, who has since been given nicknamed ‘Joe’ by his caretakers, is healthy and well. All thanks to the love and care of staff and his preferred caretaker, Augustine David. Augustine said Joe is active and naughty. He is 150kg now, where he gained 50kg since his arrival. He is still nursing and given three litres of milk every two hours. SWD chief veterinarian Dr Sen Nathan said that ‘Joe’ would probably stay with them for several more years. Efforts to rehabilitate him back to the wild will probably take place when he is about five years old or six. Sen said this would be the first elephant rehabilitation programme in Sabah and they could not guarantee if it will be successful. Currently, Joe probably thinks he is more human than elephant since he is cared for by a human thus it will be difficult to rehabilitate him to the wild. 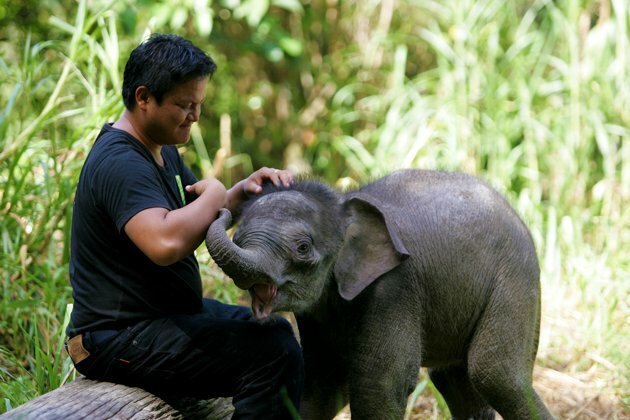 The elephant rehabilitation programme will take place at the Borneo Elephant Sanctuary in the Kinabatangan.